Korean battery maker LG Chem is in a legal battle with its Chinese rival ATL over technology patents in the US, the Korean company confirmed on Tuesday. 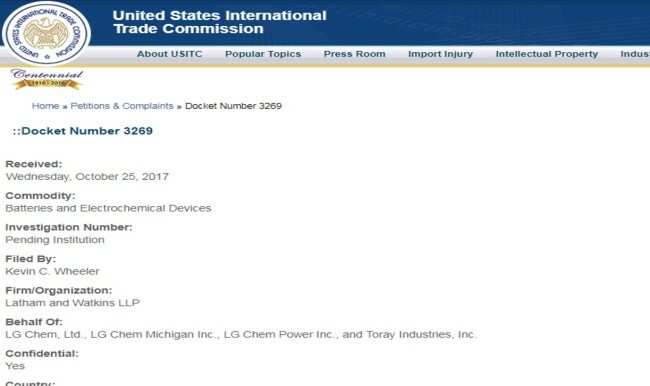 Last month, LG Chem and its Japanese partner Toray filed a complaint against ATL in Michigan where the South Korean company has plants producing batteries for clients including General Motors and Chrysler. LG accused ATL of infringing three US patents covering an LG-developed technology related to battery components called separators. LG Chem has outsourced production of its separators to Tokyo-based Toray since 2015. The Korean firm also called the US International Trade Commission not to import ATL’s batteries, saying, ATL is “flooding the US market with inexpensive low-quality batteries made entirely in China.” It contrasted its facilities and employment in Michigan with the “virtually zero investments in the US economy” made by ATL. The batteries at issue are being used in electronics made by drone maker DJI and smartphone maker Oppo. LG Chem said the complaint is only about technological infringement. “We filed a complaint only because we found ATL infringed some of our technology patents and to protect our patents and intelligence rights,” a LG Chem official said.